Arnie Baker has posted version 3.0 of his slide show, reflecting what he said in Lancaster on Sunday. We won't go over it slide by slide, but give a rundown of the changes from previous versions. For the most part, the changes are refutations of arguments that have been made against Landis, and extended documentation of charges that Baker has previously made about the testing procedure. 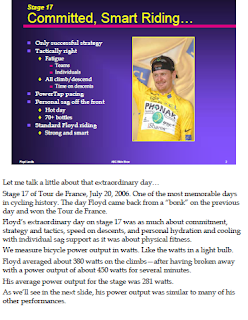 Page 2 begins an argument against the claim that Landis' performance on Stage 17 to Morzine was somehow "superhuman" and therefore evidence in itself of doping. 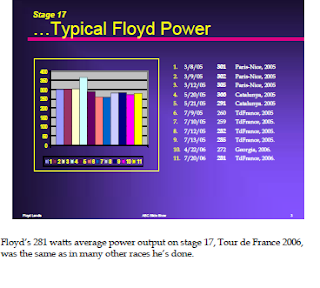 Page 3 documents similar power outputs from Landis at other races, to document the point that is was not out of line with previous race efforts. 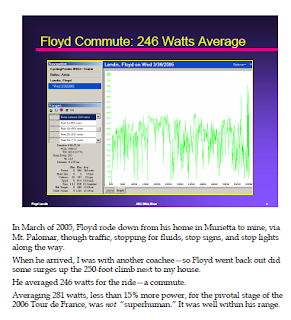 Page 4 tries to show that Morzine wasn't even out of line for a training run, showing a "commute" from Landis's home in Murrieta over Mt. Palomar to San Diego, concluding with some hill intervals. 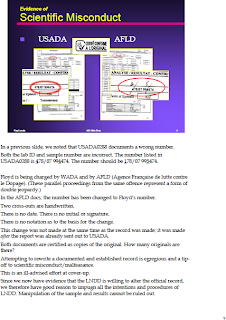 Page 9 shows an example of changes to "original" documents between the version of the LDP provided to USADA and then to the AFLD. Baker calls this "scientific misconduct". Page 13 has been seen at TBV before, isolated, but is here in context. Baker is showing raised stakes on what had previously appeared to be a simple typo on a sample number might be confused with an actual sample. It's not clear this is a real problem when one looks at the timelines of when the samples were processed, but Baker dodges that complaint by suggesting this was why USADA fought so hard to delay giving the information to Landis. 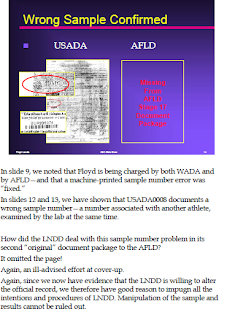 Page 14 makes another charge about the "original" LDP sets, because one of the pages of the USADA pack cited in an early slide show has somehow gone "missing" from the version in the AFLD LDP. This raises the question about what other exculpatory material might be intentionally missing from either LDP. Page 26 goes over a page that seems ripe with errors, compromising its documentary value. 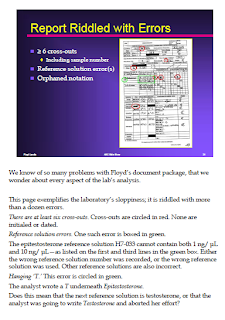 What becomes particularly interesting in this page are the things boxed in green, which appear to document errors in the reference solutions used in the process. This is important, because unlike many other typos, it speaks directly to the proper or improper execution of the test protocol, and could significantly affect the analytical results. It raises questions about all the reference solutions and the concentrations used in all procedures. 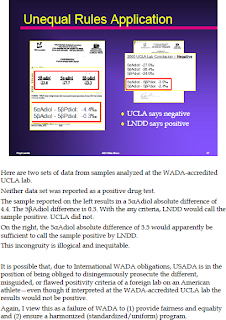 Page 36 documents an argument that the apparent LNDD criteria would declare known-to-be-clean members of the control group in the UCLA validation study to be dopers. 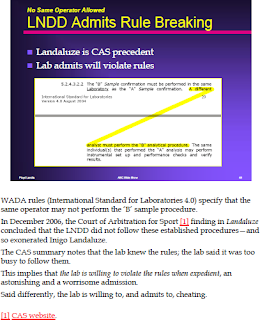 This argues against interpreting the -3.57 value as a positive indication in an absolute sense, but still runs into the WADA criteria of 3.0 that is supposedly beyond question by the rules of the process. It also doesn't address the metabolite that came in at -6. Nevertheless, there appear to be questions about the "single metabolite" theory that LNDD ought to answer. 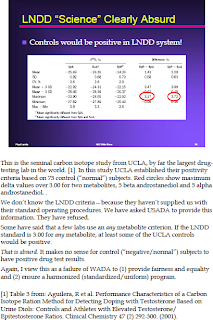 Page 37 shows a two lab report from UCLA, where onet has a -4.4 reading for one metabolite and another a -3.5, and neither was declared a positive, where the LNDD criteria would apparently call both dopers. Baker is complaining about unequal interpretation of results between labs. The larger question may be unanswerable by the hearing, and it may or may not be useful in arguing against LNDD's criteria. Page 48 documents that LNDD admitted in Landaluce, a previous case, to breaking rules when it considers it expedient to do so. 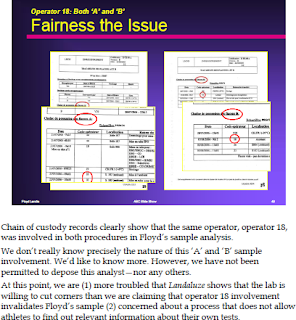 Page 49 documents the possibility of a problem similar to Landaluce, where Operator 18 appears to have worked on both Landis' A and B samples. This has been argued in various forums, and it is not clear from the records what Operator 18 did on both. So far, Landis has not been able to ask questions that would resolve the issue one way or the other. Baker says they are less concerned about the duplicate operator than they are the Landaluce admission of a lab willing to break rules, and the equity of a system that doesn't let them get the information to resolve the open question. This leaves us with the impression Baker is tuning the public presentation of existing arguments to address criticisms that have been heard on previous versions. It doesn't, to us, add appreciable weight to the factual arguments already known. However, it is still an important evolution, because testing the presentations of the arguments has two important goals. First, much of the public still remains oblivious to the details of the case, and may only see the final version as summarized by various media at the time of the hearing. Bolstering good arguments and weeding week ones or ones subject to ridicule ("vanishing twin") will make the ultimate version more persuasive. Second, there is only a limited amount of time for case presentations at the hearing, and practicing points to be made and organizing the message are important. While we believe some of the big arguments are being hidden at this time, every bit of practice with the weaker arguments is still useful. It is troubling to see that the agencies appear to be willing to alter "original" evidence to address criticisms made in public, and admit to breaking procedural rules when it appears to be convenient. Dirty little fact. Lim has right of first refusal for PowerAgent, and has silently admitted using 'features' in WKO+ with Landis' data... Saris' efforts continue to fall short. While I appreciate that Baker's presentations are still, in part, aimed at correcting the simplistic and negative first impression most people got when Floyd was first accused, I still think Baker has to learn that a good argument is not made better by overstating it. Some of his commentary on these slides just seems way over the top. If someone was making similar jumps against Floyd, I know I would think they were being totally unfair. Baker sort of comes across as the "bad cop" in a "good cop, bad cap" routine. While I am not an expert on presentations, nor do I play one on TV. I've watched/listened to both presentations that have been published online as well as review the slides and I'd disagree With the overstating argument. I think the notes are his talking points for when he speaks at a presentation. I don't think he is overstating. If anything I think the presentation, because of what it is, a publicity tool, does not dive deep enough into their main arguments. Instead it covers all the mistakes they are willing/able to talk about to let the general public know the problems with the case. In essence their political stump speech as they travel around the country evangelizing the wicked ways of WADA, UCI and LNDD. It may seem like overstating to you and me because we see it over and over as we watch the case closely. where as most people that go to the speach see it for the first time. Just this laymans point of view. (1) First, slide 26. The comments to the document (it's USADA 0200) are half disingenuous. This is a sample preparation log for the confirming T/E test, in this case with Operator 18 running the test. If you compare this document to another such log--USADA 0079, test run by Operator 28--you'll see that the two are completely consistent. The difference is that Operator 28 breaks out the 4 steps of the E and T preps onto separate lines; operator 18 will put two steps on the same line (though in different columns) if the same concentration of fluid is being used from one step to the next. Operator 18 seems prone to forgetting which line the quantity should be entered on, and that accounts for most of the corrections. (Their consistency extends even to differing amounts being entered for the same step--e.g. USADA 0200 entering 60 for the 2nd Testosterone step vs 6 on USADA 0079, because in this case USADA 0079 was using a solution 10x as concentrated for the step as USADA 0200 was using.) So criticizing the corrections on USADA 0200 seems cheap-shotting (cheap-shooting?) to me. What isn't a cheap shot on slide 26, though, is the fact that these operators can't seem to agree on what the concentrations of these different numbered solutions actually are. That's very disturbing, and since while LNDD tells us how much of what solutions should be added they don't tell us of what the solutions are composed, we have no way of knowing whether the test preparations really were consistent, or potentially differed by one or two orders of magnitude in the concentrations of the solutions used. (2) With respect to the document used in slides 13 and 14 (the document omitted from the AFLD set): this is USADA 0008, the third of the three "Ferret" documents first published here on TbV. 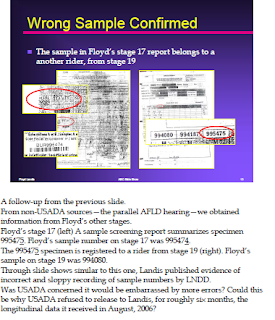 It, along with the other Ferret documents is notably more illegible than almost all of the rest of the USADA set. Dr. Baker says their bad state is the way they received them from the USADA. Recently, a cleaner copy of USADA 0007 turned up, and TbV published that too. Looking at the difference in legibility, it occurred to me that I've seen copies illegible in a similar way when the document being copied was a fax printed on thermal paper. I wonder if, in fact, USADA 0006-0008 were all of them originally not sent by LNDD to USADA, but had to be faxed to USADA after the other documents had been properly copied and sent. But USADA 0008 is unique among all the USADA documents in that it's the only one that was the second side (the verso, we'd say in the printing trade) of a piece of paper--all the rest are first sides (the recto, if you must know). Why do I say 0008 is a verso? Because its binder holes appear on the righthand side. Now, if--for whatever reason--USADA 0006-0008 were not originally part of the LNDD package, and suddenly the LNDD had to make a whole new package of documents for the AFLD, it seems to me perfectly in character with the many SNAFUs already noted that in making the new set for AFLD the copying maven at the lab forgot to turn whichever page it was over in order to copy 0008. I think this may be another instance of a competency-challenged LNDD employee, rather than deliberate deceit. But I have no way of knowing, and I could be wrong. marc wrote: "This is a sample preparation log for the confirming T/E test, in this case with Operator 18 running the test. If you compare this document to another such log--USADA 0079, test run by Operator 28--you'll see that the two are completely consistent." Q. What if they are BOTH wrong recordings of the refernece solutions. I have a more simple question...if these tests are so reliable....Why are there 370 pages of documentation for one test???? Seems a little over the top for one drug test. Anyone notice how quiet it is over at DPF? No one's really commented on the slide show?? Hmmm. Could this be a sign that maybe, just maybe, some 'rational' folks are perhaps becoming persuaded that the lab might have really screwed up, big-time? Baker strengthens previous arguments. There is nothing over the top. Considering everything, he is understated. I am incensed at the incompetence, ignorance and/or willul violation of lab procedures. LNDD screwed this up big time. Yes, it sure has been quiet over at DPF. It seems like all us "dummies" are just letting duck and you3 do their work, and getting pretty excited about the result. RH seems to have run out of responses. He seemed to just be saying that there must be a rational explanation for the problem duck and you3 are discussing, but it seems he and OMJ have no idea what the explanation is. Very interesting. One of the anonymouses wrote: "Q. What if they are BOTH wrong recordings of the refernece solutions." There's no doubt that both operators made mistakes in noting the concentration of one or another of the solutions. I think with a little more documentation we could sort that out. Solutions in the same "family" look like they differ from one another by concentration factors of 10. Where are the data files?